Copyright © 2000, 2001, 2005, 2007 by Aaron Shepard. May not be published or posted without permission. PREVIEW: Two-Eyes is different from her sisters and others, because she has just two eyes. Once there were three sisters who lived alone in a cottage in the woods. They had been there as long as they could remember, and they never saw anyone else. Now, the oldest sister was no different from other people. Her name was One-Eye. She had just one eye, right in the middle of her forehead. The middle sister was also quite ordinary. Her name was Three-Eyes. She had one eye in her forehead, and one on each side of her face. But the youngest sister was different. Her name was Two-Eyes, and that’s just what she had. Because Two-Eyes was not like others, her older sisters were ashamed of her and picked on her all the time. They dressed her in ragged hand-me-downs and only let her eat leftovers. Now, the sisters owned a goat, and every day Two-Eyes took it to the meadow to graze. One morning, when she’d had hardly anything to eat, she sat in the grass and cried her two eyes out. All at once, an old woman stood before her. But the biggest surprise was that this woman had two eyes, just like Two-Eyes herself. “What’s wrong, my dear?” asked the woman. And the old woman vanished—just like that. The goat bleated, and a little table and chair appeared. The table was set with a tablecloth, plate, and silverware, and on it were dishes and dishes of wonderful-smelling food. “This sure is better than leftovers!” said Two-Eyes. Next morning, when Two-Eyes started out, One-Eye said, “I’m coming along to make sure you tend the goat properly.” Then she followed Two-Eyes to the meadow and kept a careful eye on her. So Two-Eyes never got to use the old woman’s rhyme. When they got home, Two-Eyes ate her bowl of leftovers. Then she went off to the woods and cried her two eyes out. “Don’t worry about that!” said the woman. “You can stop her if you like. Just sing her this song. Then the old woman vanished. As Two-Eyes sang, the eye in her sister’s forehead went to sleep—but her other two eyes didn’t! Three-Eyes pretended, though, by closing them almost all the way and peeking through. She couldn’t quite hear what Two-Eyes told the goat, but she saw everything. “Then let’s get rid of the goat,” said One-Eye. And they drove it off into the woods. Again the old woman vanished. Two-Eyes went home and waited till her sisters weren’t looking, then dug a small hole and planted the seed. The next morning, a tall tree stood before the cottage with leaves of silver and apples of gold. Two-Eyes found her sisters gaping at it in astonishment. Riding toward them was a knight in full armor, his visor over his face. “Quick!” said One-Eye. “Hide our little sister!” So they lowered an empty barrel over Two-Eyes. The two sisters gasped. They scrambled over to the tree and jumped up and down, trying to grab the apples. But the branches just lifted themselves higher, so the apples were always out of reach. Meanwhile, Two-Eyes raised her barrel just a little and kicked a stone so it rolled over to the knight. So Two-Eyes lifted off the barrel. “My word!” said the knight. “She’s the loveliest young lady I’ve ever seen!” He raised his visor for a better look. Sure enough, the knight had two eyes, just like their sister. An apple dropped right into her hand, and she gave it to the knight. So the knight took Two-Eyes back to his castle. And since they had so much in common—after all, they both had two eyes—you can be sure they lived happily ever after. As for One-Eye and Three-Eyes, day after day they stood under that tree and repeated their sister’s words. But the apples never fell for them, and they never did figure out why. For the old woman’s sleeping song, any tune will work, but here’s the one she taught Two-Eyes. Is your eye a-wake? Is your eye a-sleep? Ever have trouble sleeping? Then you can use the old woman’s song on yourself! Just be sure to say the right words. Here they are, for anyone with two or more eyes. 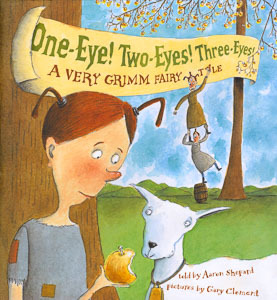 This telling is based loosely on “One-Eye, Two-Eyes, and Three-Eyes,” number 130 in the tales of the Brothers Grimm. For a different version, from the Ukraine in Eastern Europe, see One Eye, Two Eyes, Three Eyes: A Hutzul Tale, retold by Eric A. Kimmel, illustrated by Dirk Zimmer, Holiday House, New York, 1996.